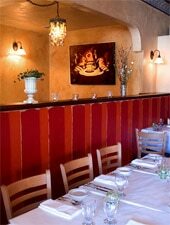 A classic French bistro with a quirky nature, located on a tree-lined Providence street. : This longtime Providence haunt, run without pretense by husband and wife Kristin and Matt Gennuso, is gutsy and familial. She’s in the front of the house, which runs seamlessly, and he is in the kitchen, where he appropriates French bistro concepts with little nods to local influences. Dishes like a grilled culotte steak with black trumpet mushrooms and port wine could be straight off the Left Bank, as could roasted golden clams and mussels en cocotte with white wine and garlic --- though the clams are ones you’d be hard-pressed to find outside Rhode Island. Matt makes all of his own specialty sausages, as well as the condiments for a seasonal gourmet hot dog cart and food truck (serving sausages, hot dogs and meaty sandwiches) that appear around town. Vegetarians will like the meat-free tasting menu, while foodies on a budget will appreciate the Wurst Kitchen, a communal restaurant-within-a-restaurant serving sausages and small plates Tuesdays to Thursdays. End the meal by sharing a cheese plate or a selection of chocolates. French cooking may not be trendy anymore, but thanks to the Gennusos, it should stay the course here for years to come.